The over-the-top foam generator (OFG) is designed to produce and inject foam into flammable liquid storage tanks above the liquid surface. It is welded from the outside into the tank wall at the top of the tank. The OFG is connected to a foam solution supply system and equipped with a test outlet, that makes it possible, by simply moving a test cover (see drawing overleaf), to test the unit without putting foam into the tank. The OFG can be used both for tanks with fixed and/or floating roof. The OFG is calibrated to customers flow and pressure requirements within its minimum and maximum limits. The MRM is a medium expansion foam generator, intended for stationary installation. The body is made of stainless steel, which makes the unit suitable for use outdoors in rough climate as well as indoors. It produces a high quality foam, for covering and filling up, e. g. in bounded and diked areas, basins, under process equipment and in loading areas. Due to its low weight, MRM is easy to install. 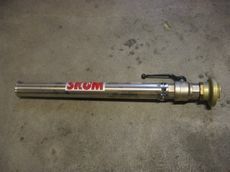 SKUM MLR - the low expansion foam branchpipe MLR-40 A and MLR-40 SA is a portable lightweight, stainless steel branchpipe, designed for an optimum combination of foaming and jet range. Type MLR-40 SA has a built-in foam concentrate inductor. SKUM PFG - the high back pressure foam generator PFG and PFG-S is a foam producing unit, which can handle a counter pressure of up to 40 % of its inlet pressure. Type PFG-S has an integrated foam concentrate ejector. The unit is primarily intended for supplying foam to subsurface or semi subsurface tank protection systems, but also to foam inlet heads and pourers at tank tops, and to other installations. SKUM HSSS - the HSSS is a foam application device intended for delivery of expanded foam through a hose to the liquid surface of a tank. 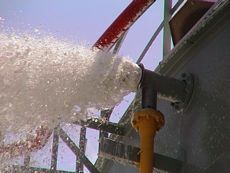 It consists of a special woven hose folded into a container mounted on the outside of the tank. The hose is separated from the liquid inthe tank by a sealing membrane (SM). 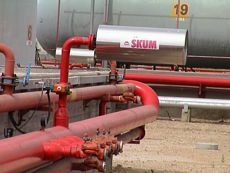 SKUM SM - the SM valve is designed to be used as a check valve sealing off the tank product from the foam line in a “subsurface system” or as a gasproof check valve in an “over-the-top” foam system. A PTFE membrane is covering a stainless steel mechanism, preventing product or gas to enter the foam supply line. SKUM HiEx - the water-driven foam generator HiEx-250 WD is designed to produce high expansion foam up to 190 m3 /min. The electric-driven foam generator HiEx-300 EL is designed to produce high expansion foam up to 300 m3/min. The unit is primarily intended for wall mounting and permanent connection to a foam solution line.